Victory, as they say, has many fathers whereas failure is an orphan. England’s comprehensive failure in The Ashes in Australia will have plenty of people ducking for cover. For the players there has been nowhere to hide and they should have our sympathy. I do not believe that skilled professionals would play as badly as they have without there being some seriously good reasons. Lets try and explore what they are. First the whole idea of “Back-to-back” Ashes was a lemon. I don’t buy the “scheduling” reason given by ECB Cricket. Other options existed to avoid the Cricket World Cup fixture clash but Giles Clarke and Co. plumped for the one that they saw as bringing in the maximum short-term revenues. The Ashes is the Golden Goose and the laying of golden eggs for ten Test matches in a row in little more than half a year was just too tempting to ignore. The ECB needs money to keep the hugely overblown County system afloat (18 Counties – three times as many “top” domestic teams as any other Test country!). And Sky of course obliged, as they do, and paid up their fees. Bad money going after bad you might say. Next England were not as good as the Media hype suggested and the Australians nowhere near as bad. This isn't hindsight. At the end of the Summer series I analysed the five matches session by session. My judgment was that Australia won 27 of the 62 sessions, England 26 and that nine were drawn. The Aussies could well have won at Nottingham, should have won at Manchester (the weather saved England) and might well have triumphed at Durham where an inspired spell of bowling by Stuart Broad was the only difference between the sides. 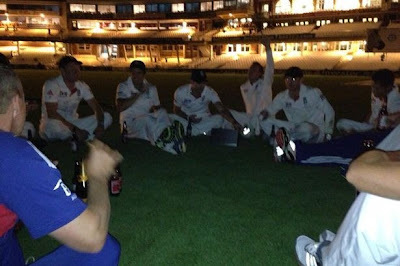 They were blown away at Lord’s – though even there they had their moments. 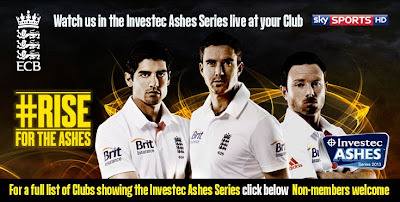 A fair result would have been a drawn series with England retaining The Ashes. It was an irritable and often downright unpleasant summer Ashes and the players of both sides behaved badly at times. The DRS confusions, poor umpiring, sledging and even urinating on the pitch suggests that the “Spirit of Cricket” wasn't too high on the agenda! And I haven't even mentioned Warner and Root ! Jerusalem was sung every day (except at Lord’s where England seemed to manage OK without it). And the depths were plumbed in the First Test at lunch, with Australia 291-9 chasing 311, when singer Sean Ruane launched into "You Raise Me Up" followed by "Rule Britannia" and finally "Land of Hope and Glory". It was cringe-making and in the long run counter-productive. During the summer I felt that there was little between the sides and I said so. One or two fine bowling performers (Anderson at Trent Bridge, Broad at Durham, Swann at Lord’s) and some solid batting from Ian Bell covered up some pretty ordinary England cricket. Only Bell averaged over 40 and the bowling was at times unpenetrative. Four of the top six run scorers were Australian and three of the top six wicket-takers. If there was little between the sides in the summer the difference was a bit of luck (always the twelfth man of course) and one or two moments of inspiration. Australia did not do themselves justice batting as a unit only reaching 300 or more in two innings (to England’s six). 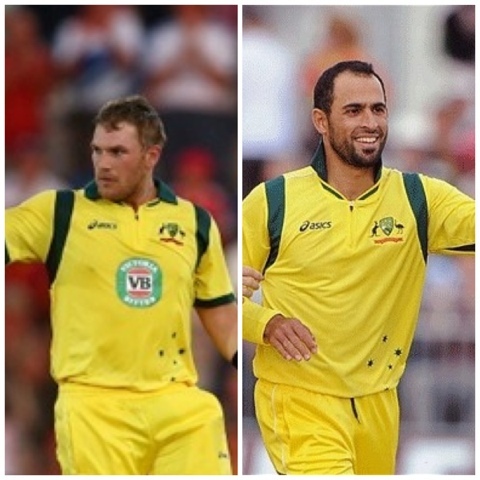 But they had their moments – and their bowling was pretty good, especially Harris and Siddle. Overall when they were good they were very good – but just a bit too often they were awful. The rivalry between England and Australia at cricket doesn't need extra hype – certainly not the uber-hype that the ECB launched. The verbals on and off the field went over-the-top as well. So when the Aussies got back home I can imagine that there was some soul-searching. Whilst they could not believe they were robbed in the summer they were certainly hard done by. England on the other hand must have known that they rather got away with it and that they were certainly not 3-0 (nearly 4-0) better then their opponents. The Ashes in Australia has been a triumph for the Aussies and they thoroughly deserve to have regained the urn. 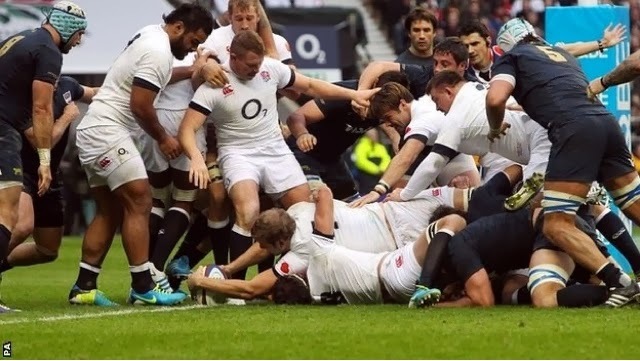 I have never seen an England side in any sport so deflated as they now seem. These are technically very good players whose minds are scrambled and who are like shell-shocked soldiers in the front line. They don't want to be there and when they go over the top the chances are that their bravado will be immediately punished by an Australian side with a great flair for attack and a solid sense of when to defend. The England players have not suddenly become donkeys led by donkeys, though the three lions on their chests must looking away in embarrassment a bit. A less leonine England I cannot recall. Its sad. I'm not struggling to get my head around Andy Murray's decision to stay away from SPOTY at all, as an article by Giles Smith in today's Times newspaper suggested I would be. I do struggle with the idea that the award is, in the article writer's words, "a pinnacle" of anything. The beanfeest is a bit of fun - worth watching on a cold winter's night if you've nothing better to do. But the outcomes are arbitrary - akin to asking the public to vote for Camembert versus Creme Brûlée versus Tripe and Onions. All worthy foods no doubt - but one better than the other? Nah! Last year Bradley Wiggins was a worthy winner. But so would Mo Farah, or Jessica Ennis or a dozen others have been. For all of them their "pinnacle" was winning whatever they won. SPOTY more of a pinnacle than two Olympic Gold Medals? Are you having a laugh? SPOTY is quintessentially British and there's nothing wrong with that. But if Mr Murray has better things to do that's his call - and frankly none of anybody's business. Like other uniquely British institutions - our Royal events and obsessions, Remembrance Sunday and the rest - there is a sense of obligation that we have to stand in line and salute. And there is an overwheening sentimentality underpinning them as well. We might shrug our shoulders and, anything for a quiet life, buy the bull for a day. Most of us do. But when somebody says "Stuff that for a game of soldiers" (or, as in Murray's case suggests by his absence that that might be his view) we have no right to criticise. SPOTY is a bit of fun for many. It's not the Nobel prize, or an Oscar. It's an inward-looking, often maudlin, sometimes downright embarrassing TV event. To take it uber-seriously as The Times article does is giving it a status way beyond anything it deserves. Nobody is obliged to watch it even less to revere it. Including Andy Murray. England has been beaten by hubris, and their scrambled minds. A brilliant bowling performance, like Stuart Broad at Durham in the summer and Mitchell Johnson in the first innings at Adelaide can win a Test match. A remarkable innings can do the same. But these are the exceptions. In the main matches are won or lost because one team collectively gets it together better than the other. If you want to understand why England is 0-2 down in this Ashes series it's not Johnson's heroics you need to study. It's who has won the mind game. Take England's second innings in the second Test. Cook and Carberry both gifted their wickets with dreadful shots within twelve overs. They weren't defeated by better bowling - they were defeated by their own scrambled minds. The fact that later some others in the England innings batted well on a benign pitch shows how foolish those gifted wickets at the top of the order were. Confidence is the key. The teams that keep on winning are those that believe they can. The teams that struggle are those that look as if they don't want to be on the Park at all. That's been England since they arrived in Australia. They know that they were lucky to win the summer series 3-0 (nearly 4-0). Cool analysis shows this series score to have been a travesty. England (just) deserved to retain The Ashes in the summer - but over the five matches they were only marginally the better team. The players on both sides know this and it is Australia who took confidence from it not England. 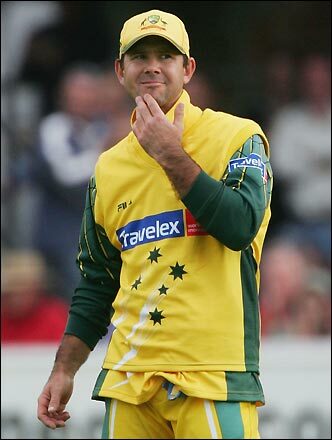 The Aussie motivation was surely "Mates we were bloody unlucky in England. We know we're better than that. In front of our own fans let's show the Poms we are". Meanwhile the English must have felt, whether they spoke it or not, "We rather nicked that one whatever the series score says. Oz is only a bowler or a couple of big hundreds away from being better than us." And so it was. This England team hasn't suddenly, qua innate ability, become no-hopers. This Aussie team hasn't suddenly been transformed into world beaters. What has happened is that the hidden factor of confidence combined with the driver of "who wants it more?" is overwhelmingly in the Australians' favour. Successive Ashes series losses finally got to Michael Clarke's Australians. They'd had enough and it hurt. And England? At the moment they had Australia 132-6 on the first day of the series they must have thought "Here we go again - we can roll this lot over any time we want !" 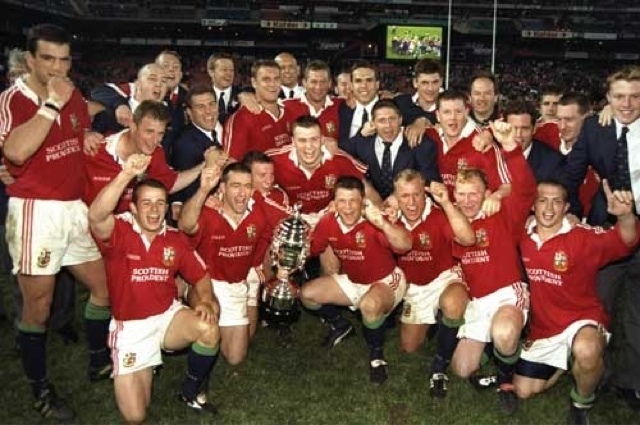 But pride came before the fall and from that moment on it has been Australian confidence and determination, combined with English hubris, which has blown England away. England hasn't suddenly become a team comprised of players without the skills for Test cricket. More than half the side is world class by any standards and have outstanding records - and the rest are more than competent. So you have to look at what is going on in their heads to find out what is going wrong. Mitchell Johnson hasn't been in a laboratory where a Dr Frankenstein has equipped him with magic arms. Physically he is the same bloke who couldn't even get in the Aussie squad only a few months ago. You have to look at what is going on in his head to find out what is going right. 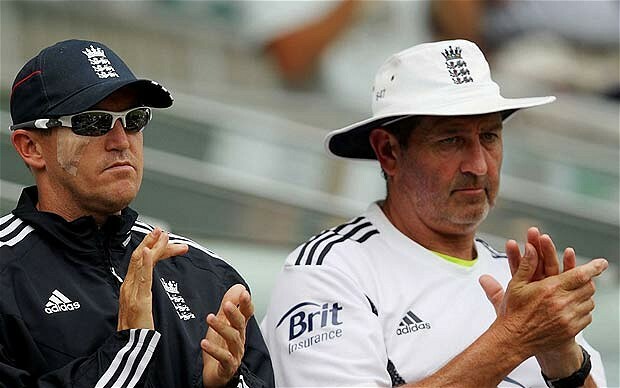 Why would Andy Flower decide to pack it in with England? Not because he's not up for the fight - he is a man with huge personal courage and principles. We'll have to wait for his inevitable book to find out! But we can guess. I suspect that he thinks that too many of the England team have become prima donnas whose ambitions are mostly concerned with boosting their bank balances and shining their egos. They are good cricketers and they know it - and they assume that their talent will carry them through. Sometimes it does - and when luck goes their way as well they'll do alright. They were very lucky in the summer of 2013 and the 3-0 Ashes series win (nearly 4-0) was a travesty. The signs of decline were there for all to see. Indeed they’d been there for a while. Winning and losing are both habit-forming. Self-belief will always beat self-doubt. In early 2012 England played three Test matches against Pakistan all of which they lost. In the three matches they averaged 191 runs per innings. It was woeful. Spineless. But then they got home and easily beat a poor West Indies side. Masters of the cricket universe again! Except that they weren’t - as a good South African side showed them immediately (2-0 series win for SA). England has at best been inconsistent over the past two years and at worst seriously in decline. Only when they are winning are they up for the fight. And they get it in their heads that a bowler is unplayable (Ajmal versus Pakistan, Johnson at the moment) so that bowler then becomes unplayable. A self-fulfilling prophecy. Is there a way back? Well there is no evidence except perhaps the straw that a year ago they came back from losing the first test in India to win the series 2-1. Can they do the same in Australia? I’d like to think so, but I don’t. The art of issuing a graceful apology seems to have passed Cricket Australia by. This was their "apology" for their earlier crass tweet showing some Sikhs as teletubbies and calling on the real Monty Panasar to "stand up". It was a foolish, unfunny and dim-witted tweet and the Australians were rightly castigated for having done it. The "apology" is almost a case study in how NOT to apologise. "Any offence caused" is the classic cop out. It suggests not, as was the case, that offence was definitely caused. It leaves room for doubt. The word "Any" implies that they believe it's possible that no offence was caused. "That was certainly not our intention" is equally facile. I doubt that anyone would accuse Australia's governing body of wanting intentionally to cause offence - so why state that it wasn't the intention to do this. Nobody is saying it was ! CA apologises unreservedly for having caused offence with an inappropriate Tweet about Monty Panasar and have said sorry to him personally. Ashes fatigue floored poor Jonathan Trott - but who in the England dressing-room is not suffering from it ? Everyone will feel sad about Jonathan Trott's illness and wish him well for a speedy recovery. But you must wonder if there been an Omertà against speaking about Trotty's problems as there was for Trescothick ? Remember those absurd press conferences when we were supposed to believe that Marcus's problems were physical not mental - denial piled on denial. The ECB did not cover themselves in glory then. Has it only just emerged that Trott is suffering from a depression-related illness? 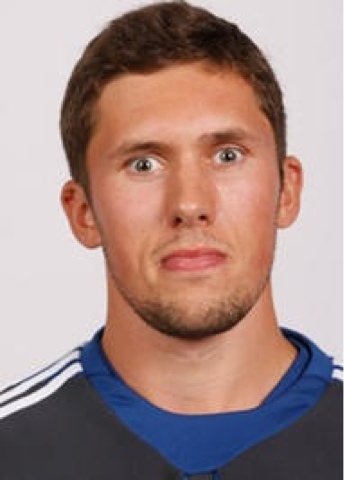 That in itself raises questions about the quality of the medical assessments the players have. All too many cricketers have had mental health issues over the years as Trott's colleague in the Squad Jonny Bairstow knows, tragically, only too well. Perhaps Trott covered up his difficulties but from what I hear and have seen I doubt it. There has always been a touch of Obsessive Compulsive Disorder behaviour about Trott at the crease. If I can see that from beyond the boundary surely the ECB wallahs could see it from close up ? The ECB's greedy and foolish decision to have back-to-back Ashes series is coming back to haunt them. England were truly awful in Brisbane. Having got Australia 132-6 in the host's first innings they then lost the plot so comprehensively that by halfway through the second day they were out of the game. The atmosphere in the dressing room must have been dreadful, nobody could do a bloody thing right, Trott was cowering in the corner and the Aussies pounced. After just four days of cricket there really does seem no way back for England whatever they may, with phoney bravado, say for public consumption. This summer the same players got very lucky and there were some fine match winning sessions from the likes of Broad and Ian Bell's late-flowering coming of age to carry them through to frankly not always deserved victories. I doubt that the Aussies will give them that chance again. Jonathan Trott's tour, and perhaps his international career with it, is over. Meanwhile a group of demoralised players who give every sign of having Ashes fatigue trudge off to Adelaide knowing that only a win there will put them on track. A loss, with Perth to follow, could mean it's all over before Melbourne as it was for Freddie's lot in 2006/7. And though no doubt Giles Clarke and his accountants at the ECB will still be banking the dollars with glee England's cricketers will have gone from heroes to zero without even passing go. The idea of "Mental disintegration", a fancy term presumably meant to give sledging in cricket a thin veneer of respectability, originated with Steve Waugh. Waugh of course did not originate verbal abuse in the game - it probably goes back as far as the game itself. But Waugh's Aussie team used it as a deliberate part of their tactics - mostly by fielders to unsettle batsmen. If we needed more evidence of the fatuousness of the "Spirit if Cricket", the nonsensical notion beloved of men of a certain age and class especially in the higher echelons of the Marylebone Cricket Club, then the ubiquity of sledging in the professional game would be it. Deliberate, calculated, foul-mouthed abuse of batsmen by fielders is cheating - pure and simple. I'm not talking about the occasional funny or even mildly rude remark. Nobody wants the cricket pitch even in a Test match to be solemn and silent. I'm referring to the sort of vulgar, constant sledging that England's batsman were subjected to at Brisbane. That is cheating pure and simple. If the Laws of Cricket included a specific reference to verbal abuse on the pitch instead of their paean to the phoney "Spirit of Cricket" it would be far more useful. It's not difficult. You place the responsibility with the Umpires. If in their judgment a fielder offends then give the Umpires the right to show that fielder a Yellow card (off for an hour) or a red card (off for a full session). Obviously you would need to give the Umpires some guidelines - but you leave it to their judgment. Why not? It happens in other sports to counter unfair play. Cricket is a great game but it is sullied by vulgar fools who think it is smart to abuse their opponents. It isn't - it has no part in the game. Of course cricket is played in the mind and unsettling a batsman with short-pitched bowling or the placing of fielders near to the bat (etc,) within the Laws is and always has been part of it. But abuse is mindless, demeaning and damaging to the sport's reputation. Enough is enough. The news of Jonathan Trott's illness and his return home is further food for thought. The Steve Waugh type of calculated sledging will work best on those players who are already mentally fragile. It's water off a ducks back to the toughies (like Steve himself) but more effective with those who are mentally vulnerable. Marcus Trescothick, who should know, has described the Australians as "... experts in the theory and practice of doing your head in". I am not saying that Clarke and his team targeted Jonathan Trott specifically in this way or that they knew that his problems were more than a bit of nerves. But I wonder whether they would see Trott's personal mental disintegration and return home as a bit of a "result". Lets hope not. The signs pointing to Australia's resurgence were there across the summer Ashes series. Australia's comprehensive win in the first Ashes Test Match at Brisbane was underpinned by their losing, according to my analysis, only two of the 14 sessions that were played over the four days. These were the afternoon session on the first day when in their first innings they fell from 71-2 to 153-6 and the first session of the final day when England scored 74 runs for just one wicket. That second “lost” session didn't really matter (and Australia did get Pietersen’s wicket in it) and the first lost session was followed by the Haddin/Johnson partnership which, as it turned out, set up Australia's winning chance – which they grabbed with both hands! So the final score in this Test match was Australia 6 sessions, England 2 with three being drawn. England's eclipse will have come as a surprise to many but analysis of the summer series in England shows that it was actually far closer than the 3-0 (nearly 4-0) match score result suggests. My own session by session analysis of the 62 sessions played actually gives 27 to Australia, 26 to England with 9 drawn. Clearly if this is right England must have had some stellar match-winning sessions – which they did. But the idea that England was dominant through the summer is wrong. Australia were within 15 runs of winning the First summer Test and they won 6 of the 14 sessions to England’s 4. They were blown away in the Second Test at Lord’s but still won 3 of the 12 sessions to England's 9. Australia absolutely dominated the Third test winning the sessions 9-2 (two draws) and were only denied a win by the Manchester weather. The Fourth test was also close on a session basis (6-5 to England with one drawn) and only Stuart Broad’s brilliant bowling at the end won for England a game Australia could well have taken. And the Fifth test at The Oval was also tight (England 5 Australia 4 – two drawn) but Australia bossed most of the match until the generous declaration which almost gifted England the match. So England’s 3-0 Test series win in 2013 was something of a travesty of a result. It could, and probably should, have been a much closer. England did mostly win the big sessions but over the five Tests they were far from outplayed. 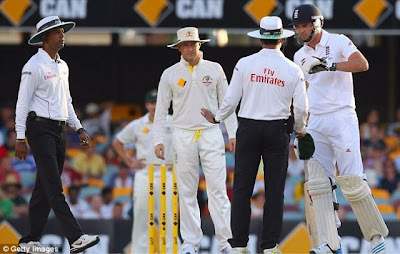 The dominance of Australia at Brisbane and England’s dreadful performance in scoring just 315 runs across two completed innings was a surprise but that Australia won was not. The pointers were there in the summer. What a weird match. The sober around me at half time predicted a bit of a rout in the 2nd Half (the drunks didn't care). England weren't brilliant in the First Half, but they were good enough. Argentina looked half a class behind. Instead Argentina very nearly WON the second half and only lost it by one point. What the hell happened at half time in the England dressing room? How could they manage instead of putting the foot on the accelerator to put it on the brake. Then break the gearbox. And look for a time as if they were trying to find a way of letting the Argentinians get level. It was awful. The England of the first half today and the second half last week v Australia might just give the All Blacks a game. The England of the second half today, and the first half last well will get slaughtered. Charles Williams was a First Class cricketer and after retiring from the game in 1959 he had a distinguished career in business and public service. He became Baron Williams of Elvel in 1985 and a Privy Councillor in 2013. “Gentlemen & Players, The death of amateurism in cricket” is a concise (just 200 pages) but thorough record of the extraordinary story of the attempts in the 1950s and 1960s to end the divide between amateurs and professionals in cricket which had endured for over 100 years. It is written with style and panache and with a real sense of Lord Williams leaning over to us and whispering “You're not going to believe this but…” ! It is a story of the English class system, of privilege, of Victorian cricket administrators still alive and well in the post war era and doing harm by neglect and ignorance. It is a story of hypocrisy and mendacity, of meetings behind closed doors, of the establishment looking after its own and of deceit. And yet, as Williams generously says at the end of the book, the guilty men (my description!) were really “…honest men doing what they honestly believed to be in the best interests of cricket”. Well maybe so but these were the same “honest men” who connived to try and keep England's planned tour to Apartheid South Africa in 1968 alive – the D’Oliveira Affair – and who fought tooth and nail against Kerry Packer in 1977. And that particular brand of conservatism is still alive today in that same MCC Committee whose predecessors feature in Williams story. That in the second decade of the 21st Century England’s finest cricket ground, Lord’s, is owned by a private members club and that this Club, the MCC of course, is still responsible for the “Laws of Cricket” may seem absurd. But back in the early 1960s this same club actually ran English cricket and a fair proportion of world cricket as well. The distinction between amateurs and professionals only existed to any significant extent in the English First Class game because MCC wanted it to - and by the mid 1950s (if not earlier) it was obvious to many others that it was an anachronism. It was hugely offensive. The amateurs were “Gentlemen” but the professionals were not - they were “Players” and paid for their labour. The amateurs were the Officer Class, the players the other ranks. The amateurs had been to Public School and University (usually Oxbridge) – the professionals had not. And so on. This was about class and the venal presumption that our leaders had to be the “right sort of chap” – especially those who could deal with the serfs. The top amateurs were mostly batsmen whose cover drives were sublime Raman Subba Row, MJK Smith, “Lord” Ted Dexter, Denis Silk, Tony Lewis, Colin Cowdrey, Roger Prideaux were some of the leading amateur batsmen in 1960. In the same year the bowling averages were dominated by professionals –Statham, Moss, Trueman, Larter, Illingworth, Shackleton, Higgs, Titmus… On the scorecards the amateurs had their initials before their names “M.C.Cowdrey”. The professionals had their initials after their names “Statham, J.B.” And the Captains were mostly amateur but in 1952 the Yorkshire professional Len Hutton had been appointed Captain of England, a role he preformed with conspicuous success. His county continued to appoint amateurs though – as did most of the others. The offensiveness of the amateur/professional divide in the post-war era seems self evident to us from today’s standpoint and it was offensive to some at the time as well. Hypocrisy abounded. The amateurs in many cases weren't true amateurs anyway, Some has sinecures at the Counties as “Secretary” or “Assistant Secretary” – roles which involved them in not doing very much at all and being paid for it. So long as they turned out and played for the County for the season of course! And on tours these “shamateurs” received compensation for loss of earnings and often made considerably more money than the professionals who were honestly paid! It was these anomalies and the surrounding complexities of trying to maintain a system which was plainly unworkable which was finally to lead to the end of the amateur/professional divide in 1962 when all cricketers became just that – “cricketers”. But before this happened there were years of bungle and confusion with an MCC committee actually being charged with pronouncing whether specific individuals were really amateur or not. This book, as well as telling the story of the end of amateurism in First Class cricket, also includes some wonderful pen portraits of players of the era. Williams knew them all and he quite rarely describes individuals pretty honestly warts and all. I found his descriptions of, for example, Colin Cowdrey and Peter May particularly revealing. This is a book about change and a record of how when a necessary change involves the removal of privilege and a challenge to established conventions in Britain it is likely to take a very long time to happen! It is not really a story of “Heroes and Villains” – there were good men on both sides of the debate. But in the 1960s, as it is sadly still so today, the life of the progressive, the people who point to the absurdities of part of our system, is likely to be made uncomfortable by the men in the better suits.